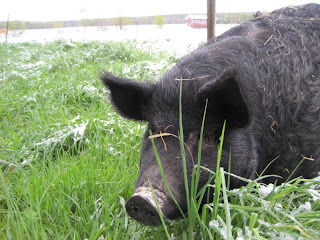 The Rustic Table: Farrowing Contest! This is our last gilt--or "heifer" in cow terms. She's the only female pig on the farm that hasn't had a litter of piglets yet. Like her sisters she's about a year old and was raised right here on the farm. She first met the boar just before Christmas and he moved in around the first of the year. There's a saying about pigs that it takes 3 months, 3 weeks and 3 days for the piglets to arrive. We think her litter will arrive soon and are offering a prize of a dozen eggs from our Silver Laced Wyandottes to the CSA member who comes the closest to guessing her due date and the size of her litter. We'll deliver the eggs with the rest of the share on May 18th. Make your guess by leaving a comment using the button below.